On Wednesday the 9th of January, trading on the euro closed up. The single currency rose on the back of a broadly weaker dollar. The US dollar index fell on account of remarks made by an FOMC member. Charles Evans, head of the Chicago Fed, hinted that the regulator would take its time with further rate hikes given the current uncertainty regarding the US economy. The FOMC’s minutes indicate hesitance among committee members to push interest rate up any higher for the time being. 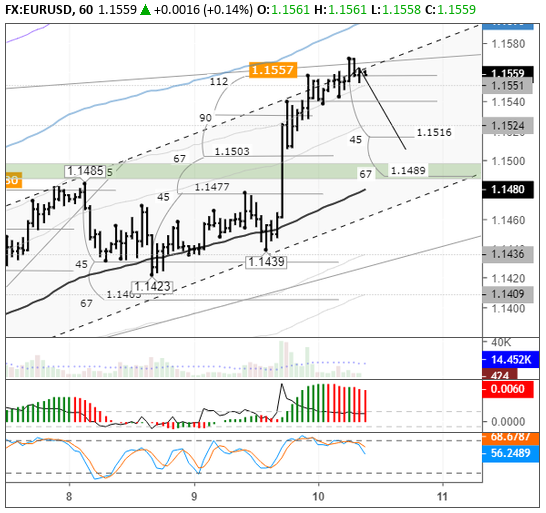 The EURUSD pair rose to 1.1558 after their publication. 10:45 France: industrial output (Nov). 15:30 Eurozone: ECB monetary policy meeting accounts. 16:30 Canada: building permits (Nov), new housing price index (Nov). 16:30 US: initial jobless claims (4 Jan). In today’s Asian session, the euro climbed to 1.1570. The rate has been moving upwards for 12 hours, hugging the upper boundary of the upwards channel. Despite yesterday’s growth on the pair, I see the rate dropping to 1.15 via a triple top. There’s nothing important from today’s events calendar. It looks like there’s nothing stopping the pair from correcting downwards to the 45 – 67 degree range. I can’t see the rate dropping any further than that for the time being, since the weekly cycles show the euro strengthening during the first half of this year. The euro is currently being bolstered by the crosses, which are the only thing saving it from decline.